HARRISBURG, Pa. (AP) — Gov. 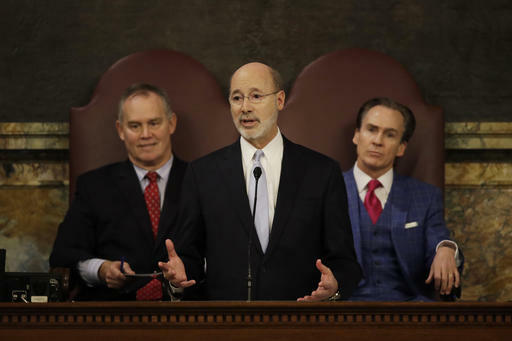 Tom Wolf asked lawmakers Tuesday to help fill a $3 billion projected deficit by imposing a tax on Marcellus Shale natural gas production and signing off on potentially touchy cuts in spending, including transportation aid to schools. The Democratic governor also wants to charge local governments that rely solely on state police for law enforcement coverage and lease the huge Pennsylvania Farm Show Complex in Harrisburg in expectation of a $200 million upfront payment. His requests to the Republican-controlled Legislature come on top of a slew of efficiency measures the governor rolled out Tuesday, including the gamble that he can save huge sums off the rising cost of health care for the poor. Wolf is also asking lawmakers to approve an increase in the minimum wage to $12 an hour, counting on the resulting higher tax receipts to help balance the budget. The plan would seek $1 billion in tax increases, including what the administration views as loopholes in taxes on sales, corporate profits and insurance premiums. The Marcellus Shale drilling tax has been blocked by Republican lawmakers for nearly a decade, in favor of a lower per-well fee that largely benefits drilling communities. Wolf’s plan also touts a $2 billion grab bag in spending cuts, efficiency steps and revenue sources that do not involve raising taxes. All told, Wolf’s $32.3 billion spending plan would seek $1 billion in new spending, or 3.2 percent more, including $230 million needed to plug holes on the current year’s books. The plan is for the 2017-18 fiscal year that starts next July 1. It would include $200 million more for public schools, special education and early childhood education. It would maintain services for the vulnerable, and fund caregiver help and day services for another 2,000 people with intellectual disabilities or autism. However, it would cut $50 million from school transportation aid because of lower fuel costs, slash tax credits and try to push grant programs onto unidentified outside sources of money. It also would eliminate an approximately $30 million grant to the University of Pennsylvania’s veterinary school. State government would rely on fewer employees and consolidate agencies and functions. The proposal starts a process of negotiation with the Republican-controlled Legislature that is supposed to result in a budget by the end of June. In the background is fear in the Capitol that Wolf and Republican lawmakers are headed for the kind of months-long stalemate that marked Wolf’s first budget. — Increases spending through the state’s main bank account to more than $32.3 billion. Including approximately $230 million being requested for the current fiscal year, Wolf is seeking approval for $1 billion in new spending, or 3.2 percent of this year’s enacted budget of just over $31.5 billion. — Does not increase tax rates on sales or income. — Raises taxes by $1 billion, largely by imposing a new tax on Marcellus Shale drilling or eliminating what the Wolf administration views as tax loopholes. — Assembles a $2 billion grab bag of spending cuts, efficiency steps and revenue sources that do not involve raising taxes. — SALES: Keeps rate at 6 percent, but eliminates exemptions on custom programming, design and data processing; commercial storage; and aircraft sales, use and repair to raise $460 million. Effective July 1, 2017. — NATURAL GAS: Imposes a new tax on natural-gas production at 6.5 percent of value to generate $294 million. Effective Jan. 1, 2017. — CORPORATE INCOME TAXES: Limits deduction for net operating losses to 30 percent of taxable income, instead of the greater of 30 percent or $5 million. Effective Jan. 1, 2018. Lowers corporate net income tax rate in steps to 6.49 percent, from 9.99 percent, in 2022, and changes how it is calculated to stop businesses based in other states from avoiding the tax on their Pennsylvania operations. The moves would raise $81 million. — INSURANCE PREMIUMS: Expands the insurance premiums tax to most previously exempt insurance entities to raise $141 million. Effective Jan. 1, 2018. — Leases the Pennsylvania Farm Show Complex and Expo Center in Harrisburg to a private entity for 29 years for an upfront payment of $200 million. The state would then lease it back, with an annual rental fee. — Collects $25 per person fee from municipalities that do not have their own full-time police force and instead rely solely upon state police for coverage to raise $63 million. — Calls for lawmakers to raise the state minimum wage to $12 an hour, up from the federal minimum of $7.25 an hour, to raise $95 million in net new income taxes. — Department of Corrections and Pennsylvania Board of Probation and Parole would merge into new Department of Criminal Justice and the Human Services, Health, Aging and Drug and Alcohol Programs departments would merge into new Department of Health and Human Services to save more than $100 million. — Reducing employee numbers to save $143 million. — Increases aid for public school operations and instruction by $100 million, an increase of nearly 2 percent to $6 billion. — Increases early-childhood education funding by $75 million, an increase of 38 percent to $271 million. — Increases special education funding by $25 million, an increase of 2 percent increase to $1.12 billion.